Polly Mackenzie was never a Lib-Dem MP, but as one of Nick Clegg's core advisers she played a crucial role during the Tory/Lib-Dem coalition period. She's just admitted the kinds of depraved horse trading that went on between the Lib-Dems and the Tories at the time in a Twitter mini-thread. 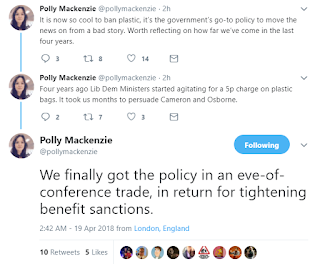 She starts off with an unobjectionable and actually rather astute observation about how the Tories seem to announce a new green measure or plastics ban every time they want to move the news away from their latest scandal, but she followed the Tweet up with some more observations that shine a light on the grotesque horse trading the Lib-Dems did with the Tories. 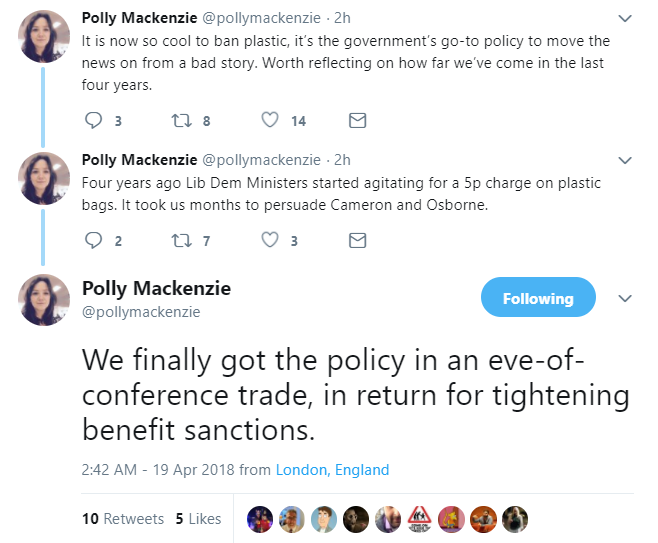 She claims that the clampdown on plastics was actually a Lib-Dem idea, and that they finally secured the limited introduction of 5p charges on plastic bags in return for their support for a toughening of the draconian Tory benefit sanctions regime. Benefits sanctions condemn individuals and their families to periods of absolute destitution for up to two years by stopping their social security payments. Benefits sanctions have been shown not to work. It's obvious that removing a person's ability to eat properly, clean their clothes, print documents, travel to interviews reduces rather than increases their ability to find work, but the Tories insisted the opposite. That condemning people to absolute destitution is a way of helping people. The Tories repeatedly and vehemently denied that there were benefits sanctions targets and league tables, and that they had created a culture of sanctioning as many people as possible. In 2013 the sanctions targets and league tables were leaked to the press. A huge proportion of people caught up in sanctions destitution have been those with mental illnesses and learning disabilities. It's obvious why. If Jobcentre staff were under pressure to sanction a set number of people per week, it's much easier to trick a few mentally ill people into committing sanctionable offences than it is to spend huge amounts of time and effort catching out the tiny minority of hardened benefits scroungers who probably know the rules of the system better than the Jobcentre staff themselves. Doctors from Britain's leading mental health organisations have demanded that the government stop their sanctions regime because "it fails to get people back into work and damages their mental health". Benefits sanctions have killed. The ex-serviceman David Clapson died after suffering benefits sanctions. He was left with no money to buy food, and no money to pay for electricity. He was found dead from diabetic ketoacidosis with no food in his stomach, a supply of ruined insulin in his powerless fridge, and a pile of CVs by his dead body. Probably the most shocking thing of all is that the draconian sanctions system costs more to administer than it ever saves in reduced benefits payments, meaning that the Tories (and Lib-Dems) actually used taxpayers' cash to subsidise their malicious treatment of some of the most vulnerable people in society. 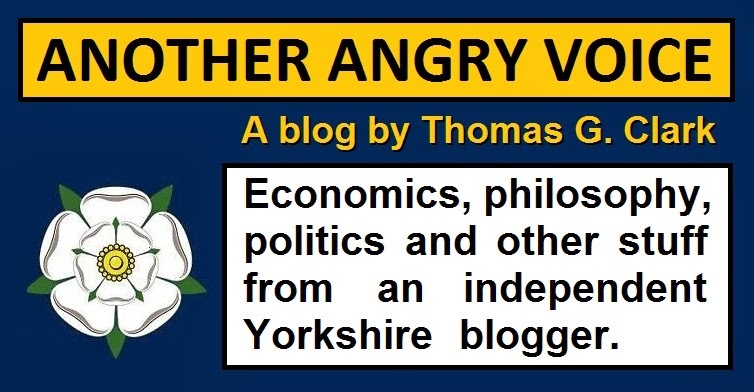 So in return for the limited introduction of 5p plastic bag charges the Lib-Dems green lighted even more savage Tory abuse of some of the most vulnerable people in society. There's nothing wrong with caring about the environment, in fact it's highly commendable, but if you're willing to kick thousands of extremely vulnerable people under a bus in order to make a minor step forward in combating excess plastic waste, then you've got your priorities disgustingly wrong. So the next time you hear someone trotting out the tired old Lib-Dem platitude about how they were a "moderating influence" on the Tories, remind them of the way they decided to give Iain Duncan Smith even more power to brutalise the most vulnerable people in society in return for nothing more than 5p plastic bag charges (that would have eventually been introduced anyway due to EU legislation).